We often watch movies on TV or computer before. But now, we would like to buy an Apple iPad. With high-resolution Retina display, iPad is a wonderful and portable device for watching movies or playing games on the go. It is much pleasure for us to enjoy our favorite movies while traveling or on holidays. But how can we put movies on iPad? It is not easy to make it unless you have the tricks. Here are 2 best ways to help you make it. Of course, there are not only one way to put movie in iPad on iPad. But one may be better and easier than another. As proven by the common vote, iMyFone TunesMate is truly the best answer to all your problems. Your videos and media files are safely transected to your iPad without any difficulty. iMyFone TunesMate has been structurally engineered for transporting media files to and from devices. You can easily manage and control the incoming content. The integrity of all your files would be protected throughout the transition. It's fully compatible with iOS 12 and older versions. It can put movies on iPad from computer directly. It can put movies on iPad from your iTunes library. It also supports to put music videos, home videos, TV shows, iTunes U, podcasts, and more on your iPad. You will not lose previous movies while transferring. You can put movies to iPad from different computers. It does not limit the format of movies. How to Put Movies on iPad from Computer? Step 1: Launch the iMyFone TunesMate application on your computer. Then connect your iPad via a usb cable. Step 2: Click on “Videos” on the upper side of your window. Step 3: Click “Add > Add File” and go to where you store the movies on computer. Select the movies and hit “Open” to transferring. What Else Can TunesMate Do to Put More Movies on iPad? You can also put movies to iPad from other iOS devices. You can export movies from iPad to computer or iTunes for backup. You can delete the movies in bulk from iPad. 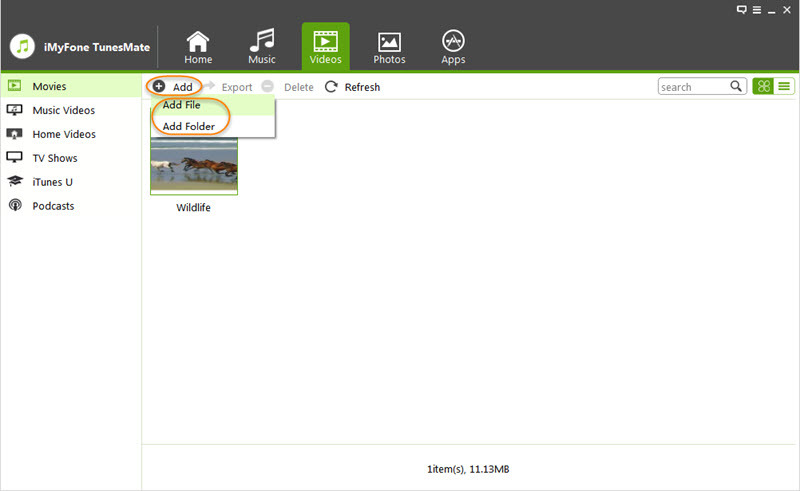 Of course, it is available for managing or transferring other media files, like music, photos, videos and more. Step 2: From the top left corner, switch to “Movies” library from “Music” library. Step 3: Go to “File > Add File to Library”. Step 4: Choose where you store the movies on your computer and select them. Click “Open” to add movies to iTunes library. Step 5: Connect your iPad to your computer. Step 6: Click on your iPad device tab and go to “Movies” from the left. Step 7: Tick the box of “Sync Movies” and check the movies you want to sync. Step 8: Click on “Sync” button to get started. You can only put movies on iPad from a single iTunes library. It only allows to transfer a few movie formats. You need to convert the format to a compatible one. When syncing, your previous movies on iPad will be covered. That means, you will lose your current movies. iMyFone TunesMate has upheld its standard in gratifying its users with the latest technology. Not only is it easy to use it offers users to indulge in multiple features. You can make use of this software to transfer videos and movies between the computer, iTunes and your iDevice with ease. It supports files of all formats and can easily transfer content. iTunes on the other hand is very restricted. It only offers a one way passage of data transfer from iTunes to iDevice and not the other way around. iTunes limits your device to receive data from only one computer. You take risks of losing your previous data when syncing. iMyFone on the other hand offers you a free range of options and supports unlimited devices.